Dual voltage regulator design . Support a variety of large-power mSATA solid-state hard drive, stable and reliable. Adapter only change the interface shape, that is, the interface from the original hard drive interface signal line out, into another interface shape, so the conversion does not need to go through the integrated circuit chip, so the speed of your hard drive performance did not have any impact, Do not need to drive (the operating system to load your hard drive on the line, do not drive the adapter card). This adapter only supports Mini PCIE interface Intel protocol SSD (that is, we often say mSATA), does not support ASUS definition SATA MINI PCIE SSD, does not support IDE PATA MINI PCIE SSD and RAID MINI PCIE SSD. These SSD appearance is the same, but the interface protocol is different, be sure to distinguish between clear! Use the wrong hard drive may lead to equipment damage! This product requires a higher level of professional users, non-professionals do not recommend buying / or suggest that you learn more about the relevant information before buying. It is important to note that the notch position of the card slot matches your SSD! 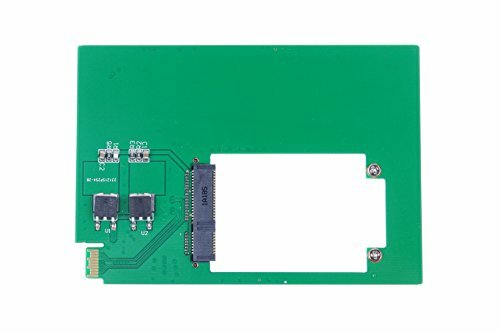 This adapter can make mSATA SSD instead of Western Digital 5mm thickness HDD WD5000MPCK WD5000M22K WD5000M21K. Dual voltage regulator design to support a variety of large-power mSATA solid-state hard drive, stable and reliable.